Designed in the 1990s and boasting a friendly clubhouse with character and a choice of beers, wines and food, Tydd St Giles Golf Course is one of only a handful in the country that offers golf 52 weeks of the year. A Par 70 course, measuring around 6,300 yards in length, it has larger than average greens, tees are immaculately kept and offer a challenge for all levels of play. Please take a look at the following pages to find more about them. At Tydd St Giles, you can find a fantastic range of facilities including Clubhouse, Changing rooms, Buggy hire, Pull trolley hire and two 9 hole practice putting courses. 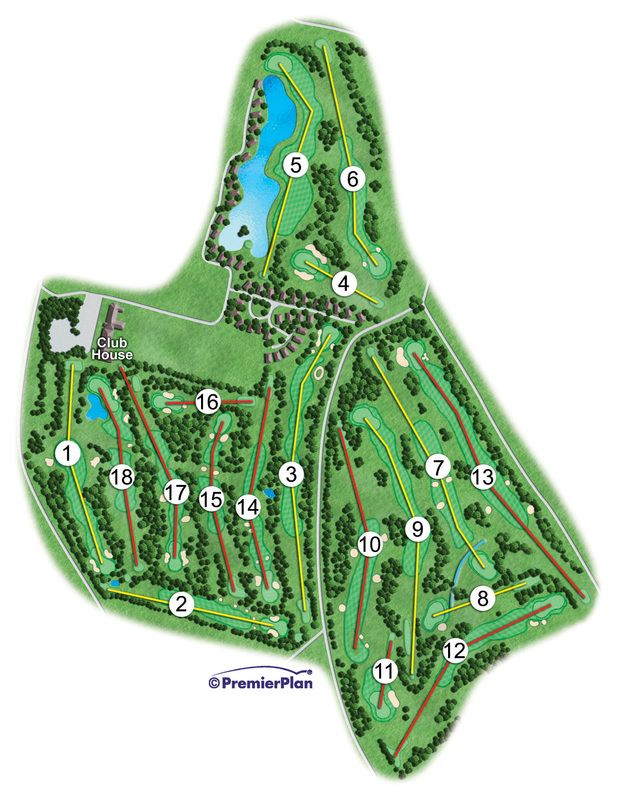 Please see our course map below and our video previews of each hole. Are you interested in competing in our Men’s Spring Open? Why not take part on Saturday 18th May 2019? Click here for more information. Please take a look at some of our videos which give a flyover preview of all 18 holes on the course. This 354 yard par 4 hole curves round to the left with two bunkers and mature trees either side of the fairway and two more large bunkers surrounding the green. This par 4 is a direct 304 yards to the green but with trees either side of the fairway in close proximity. There’s a challenging selection of five small bunkers hugging the far left side of the fairway approaching the green, and two more large ones either side of the slightly raised green. The first of the par fives and the longest hole on the course. Again there are trees either side of the fairway which curves round to the right. It’s a good hole for those who like to drive, but watch out for the trees and ditch just before the green. A nice contrast to the 3rd hole, this short Par 3 is only 145 yards long. At the green, you will find a bunker either side, but these are not too close so will hopefully be avoided. There’s a lake which covers the whole left side of the hole, whilst there are trees to the right. The fairway gets increasingly narrow before it turns to the left, which makes driving a fun challenge. If you manage to avoid any hazards you can chip onto the green which is tucked away in the far left corner. This Par 4 has a fairly generous fairway but with bushes to the left and trees to the right. The green is slightly raised with two bunkers at the front of it. This is a challenging 428-yard par 4, which usually plays into the wind. There are two bunkers halfway up the fairway, and one more a bit further up to catch out the longer hitters. The green is slightly raised and has a ditch which stretches right across the front of it. This scenic par three has a green which slides away from left to right with just one bunker positioned to the left of it. There are trees on both sides of the fairway of the final hole on the front 9. The fairway gets narrow as it curves round to the left, but there are no bunkers on this hole to avoid. On the 10th, you tee off out between the shoot of trees onto the fairway which has six sneaky bunkers to watch out for. There are two more bunkers on the left side of the green which makes it slightly tricky as the trees are very close to the right. The first par 3 on the back nine, there are trees across the left side and just one bunker to the left of the green. The green has a dip in the middle and a slope up to the back of it. The 12th is 381 yards and has a slightly generous tee off, however, it turns to the right after around 200 yards. Once you’re round the corner, there’s a large green to aim at with two bunkers at the front right side. A fairly straight hole with trees either side and a three bunkers to avoid on the fairway. The green slopes from left to right and there is a bunker either side. The 14th is a slightly tricky hole with two bunkers placed as the hole bends round to the left. Following this, there are two bunkers just short of the green which makes life tricky if you’re playing into the wind, and there is one each side of the nicely shaped green. The 15th is a shorter Par 4 which slightly bends round to the right. There are two bunkers at the end of the fairway to catch out anyone who drives too far, and two more just before the green. A 157-yard flat par three with three bunkers surrounding the green. A narrow fairway with trees either side. The fairway bends to the right with some large, flat bunkers and a long green with a bunker either side. The final hole which leads you back up towards the clubhouse. There’s a decent sized pond to the left of the green, but don’t go too far right because there are three bunkers to avoid. Once you’ve finished you can visit the clubhouse and enjoy some of the wonderful facilities Tydd St Giles has to offer. If you would like further information, please call us on 01945 871007 or fill in our contact form. To book your golf holiday today, please click the link below.